Our Double Lane Slip & Slide is a jumbo party inflatable that spans over 30 feet in length! It features two lanes for twice the fun, and is decorated in a playful red, blue, and yellow color scheme. A great addition to your next summer party or event! 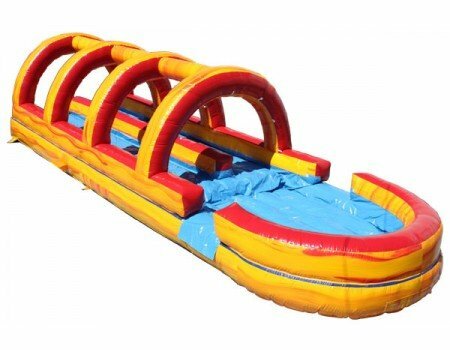 Reserving an inflatable for a Saturday event? We do ask that you let us know in the order form if Friday delivery works as well, as we can sometimes deliver one day earlier at no additional cost! With us, you can count on prompt delivery and set up/teardown.